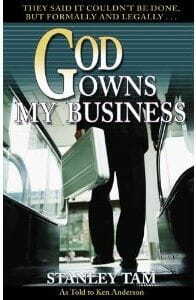 Stanley Tam, author of “God Owns My Business,” is a hero of mine. One of my favorite stories is when Stanley describes how he was instructed by God to build a new $3 million building, but to do it without any debt! The problem was that Stanley had only accumulated $600,000 to date. After prayer, Stanley knew God wanted him to step out in faith and to begin building. Imagine Stanley’s surprise when 18 months later the new $3 million building was complete without any debt, and Stanley’s business still had $600,000 in the bank! Stanley learned how to trust in God rather than lenders. Whom do you trust? Building a multi-million dollar business with only $37.00 capital is impossible. To even hope of succeeding with a process that four other companies tried and failed is impractical. But this man did it, because he found the right answer to business success. God Owns My Business is the amazing biography of a man who built the first business of it's kind ever to succeed in the United States. Purchase here. Originally published February 25, 2013.